Background Genetic variation in complement genes is a predisposing factor for atypical hemolytic uremic syndrome (aHUS), a life-threatening thrombotic microangiopathy, however interpreting the effects of genetic variants is challenging and often ambiguous. Methods We analyzed 93 complement and coagulation genes in 400 patients with aHUS, using as controls 600 healthy individuals from Iowa and 63,345 non-Finnish European individuals from the Genome Aggregation Database. After adjusting for population stratification, we then applied the Fisher exact, modified Poisson exact, and optimal unified sequence kernel association tests to assess gene-based variant burden. We also applied a sliding-window analysis to define the frequency range over which variant burden was significant. Results We found that patients with aHUS are enriched for ultrarare coding variants in the CFH, C3, CD46, CFI, DGKE, and VTN genes. The majority of the significance is contributed by variants with a minor allele frequency of <0.1%. Disease-related variants tend to occur in specific complement protein domains of FH, CD46, and C3. We observed no enrichment for multiple rare coding variants in gene-gene combinations. 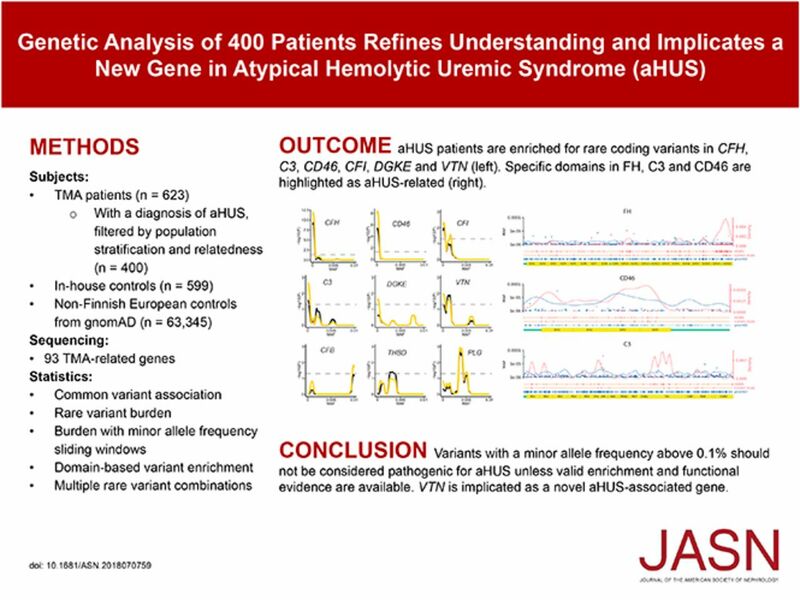 Conclusions In known aHUS-associated genes, variants with a minor allele frequency >0.1% should not be considered pathogenic unless valid enrichment and/or functional evidence are available. VTN, which encodes vitronectin, an inhibitor of the terminal complement pathway, is implicated as a novel aHUS-associated gene. Patients with aHUS are not enriched for multiple rare variants in complement genes. In aggregate, these data may help in directing clinical management of aHUS.